At the point, and thicker lines when held at an angle. These Crayola washable markers are. They're made of Non-toxic materials and feature aunique conical tip that allows for thin lines. specially formulated to wash from the skin and most fabrics that are used in children's clothing. Perfect for small fingers, kids can grasp the chalk and color large areas quickly and easily. Includes 12 non-toxic multi-colored sticks of Crayola Drawing Chalk in assorted colors. Go big and bold with Crayola Washable Sidewalk Chalk. Ideal for sidewalks and driveways, this set gets kids outside for artistic, imaginative fun. This set includes a diverse range of colors, from classic red, yellow, to the blue hues. It can hold tools such as Prismacolor / Crayola / Marco Raffine color pencils, watercolor pencils, sketch pencils, gel pens, blender pencils, marker pens, eraser or makeup brushes in pencil cases. Colored Family Organized Pencils: It gives you easy access to the pencils without taking up a lot of space. 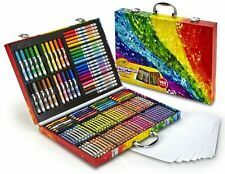 140 art supplies: 64 Crayola crayons, 20 short colored pencils, 40 washable markers, 1 art storage case, and 15 large sheets of paper. Keep all your craft supplies in a single spot with the Crayola Inspiration Art Case. Crayola COLORED PENCILS Portfolio Series Blendable and smooth laydown. While parents and teachers never want to discourage big and bold art, colored pencils are an ideal tool for children to use to satisfy their urge to draw smaller, intricate shapes. A set such as this one, with 50 different colors, also gives children the chance to explore the world of color. 150 Crayola colored pencils rich and vibrant colors. Features soft yet thick and break-resistant leads designed ideally for mixing, blending or practicing more detailed techniques. Celebrate diverse ethnicities and skin tones with Crayola's Multi-Cultural Washable Markers! All markers have a refined conical tip for precise marking for dots and lines, as well as choice between thick or thin lines, or even a ribbon effect with tapering lines that go from thick to thin. NEW CRAYOLA COLOR WONDER ACTIVITY SET. Size:Single Featuring a convenient design that lets you twist to advance the pencil core, Crayola Art with Edge Color Twist Pencils never need sharpening, so you can keep your creative juices flowing without interruption. The 24-count box offers a wide variety of hues including complementary colors great for shading. Crayola Art with Edge Color Twist Pencils pair perfectly with Crayola Art with Edge coloring pages and come in a stylish colorable box for easy storage. Crayola Twistable: includes 50 Crayola Twistable colored pencils. Instead of pre-sharpened colored pencils, what about colored pencils that are always sharp?! twistable colored pencils are ready to color whenever and wherever you are. Crayola Signature Sketch & Detail Dual-Tip Markers are the versatile art tool with two ways to create in each marker! These premium art tools provide great creative versatility in colouring and art projects. Crayola Twistable Colored Pencil Set features durable plastic barrels to protect the 2 mm leads from breaking while just turning the barrel end twists up the color thereby avoiding a need for sharpening. Crayola Colored Pencils 100 Colors 688100 - Sold as 100/Box. Crayola Colored Pencils unleash the power of kids' imaginations! These Pencils have intense colors with smooth lay down and are pre-sharpened. Crayola Dual Ended Coloured Pencils are the perfect tools for adult colouring! Includes 12 dual ended pencils and a sharpener. Triangular shape promotes a proper writing grip. Easy-Grip Colored Pencils! Perfect for little hands! Nontoxic and kids friendly. 8 Colours || Brown, Purple, Yellow, Orange, Green, Red, Blue, Black. Brightly colored pencils are made with thick, soft leads that won't break easily. Includes:12 Colored Pencils.